Change color based on temperature. Adhesive backing for mounting to cabinets. Temperature accurate to +- 1.5 degrees. Temperature displays from 53F to 110F. 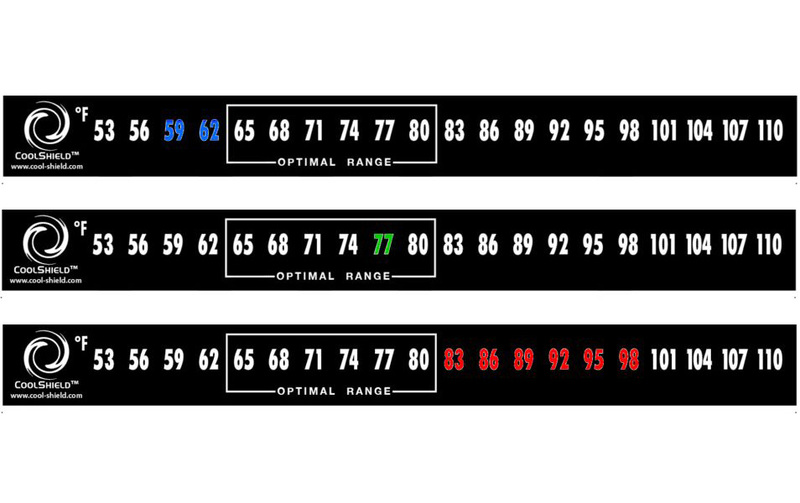 Color-coded adhesive temperature strips for at-a-glance identification of thermal issues. The Cool Shield color-coded adhesive temperature strips are a unique and effective way to monitor temperature in your server cabinet rows. The numbers are color-activated to provide a clear warning if the temperature is outside of the ASHRAE recommended range. The strip will display red if the temperature rises above 81 degrees and will display blue below 64 degrees. The more extreme the temperature, the larger and more prominent the warning is displayed. For example, if the temperature is 95 degrees, all “hot zone” numbers starting at 81 will display red. This allows for easy identification of trouble spots walking down the aisle.